Why is it that some leaders and organizations are able to inspire greater loyalty and engagement among their customers and employees alike? How are they are able to achieve and sustain inordinate amounts of success for years on end? Whether they realize it or not, all great and inspiring leaders and organizations think, act and communicate in the same way… and it is the complete opposite from everyone else. 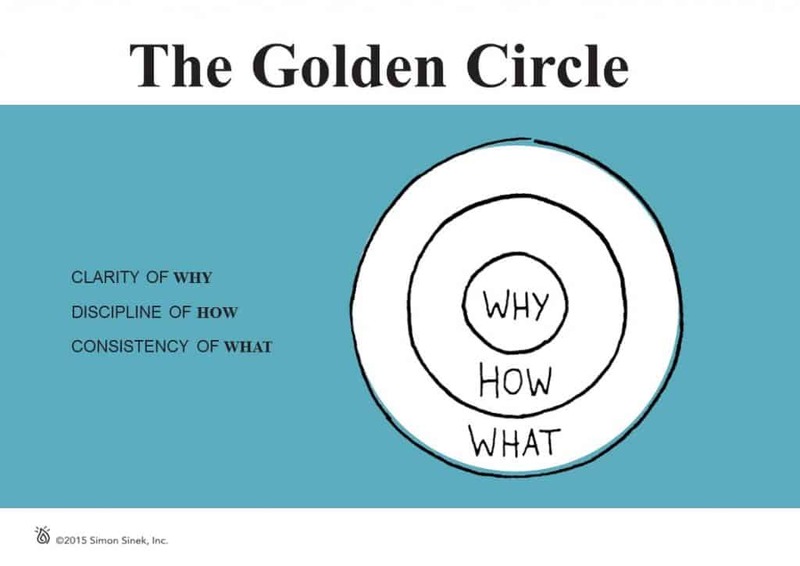 This simple idea is The Golden Circle. It is a concept discovered by optimist and author Simon Sinek. Every organization and individual knows What they do. For an organization, these are the products they sell or the services they offer. For an individual, it is their job title or roles. Some organizations and individuals know How they do what they do. The Hows are an organization’s or individual’s strengths, values or guiding principles. These are the things they feel set them apart from their competition; the things they think make them special or different from everyone else. Very few organizations know Why they do what they do. Why is not about making money. That’s a result. People naturally communicate from the outside-in; they typically go from what is easiest to understand to what is hardest to understand and explain. They tell people What they do, tell them How they are different or better, and then they expect a behavior like a purchase, a vote or support. The problem is that What and How do not inspire action. Facts and figures make rational sense, but people do not make decisions purely based on facts and figures. Starting with What is what commodities do. 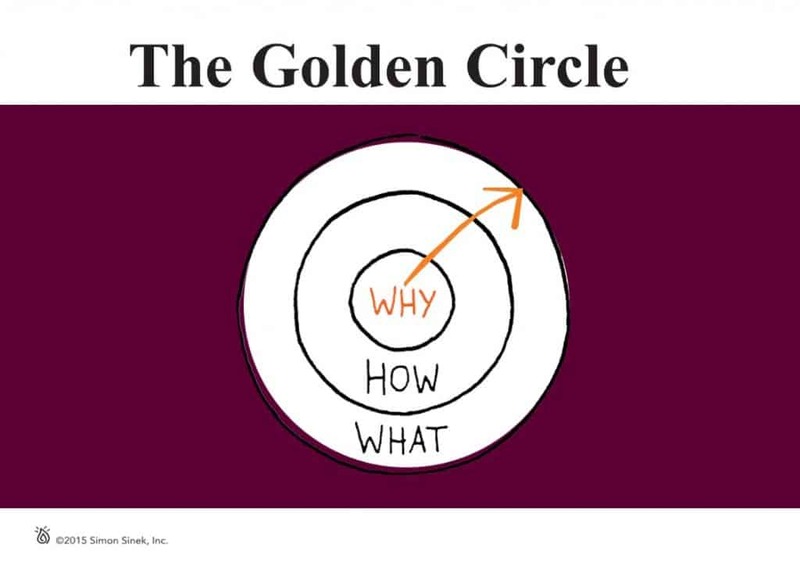 Starting with Why is what leaders do. Leaders and organizations with the capacity to inspire all think, act and communicate from the inside-out. 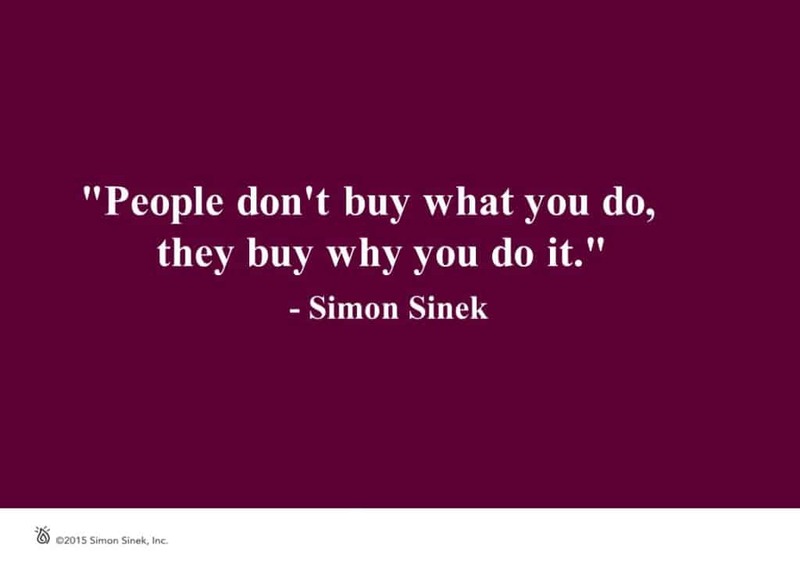 They start with their Why. When they communicate their purpose or cause first, they communicate in a way that drives decision-making and behavior. It literally taps the part of the brain that influences behavior. If the people at this firm actually believe in their Why and think, act and communicate starting with their Why, they will attract people who believe what they believe and who want to be a part of their cause. None of this is opinion. It is all grounded in the tenets of biology. A cross-section of the human brain shows that its layout perfectly correlates with the three major components of The Golden Circle. 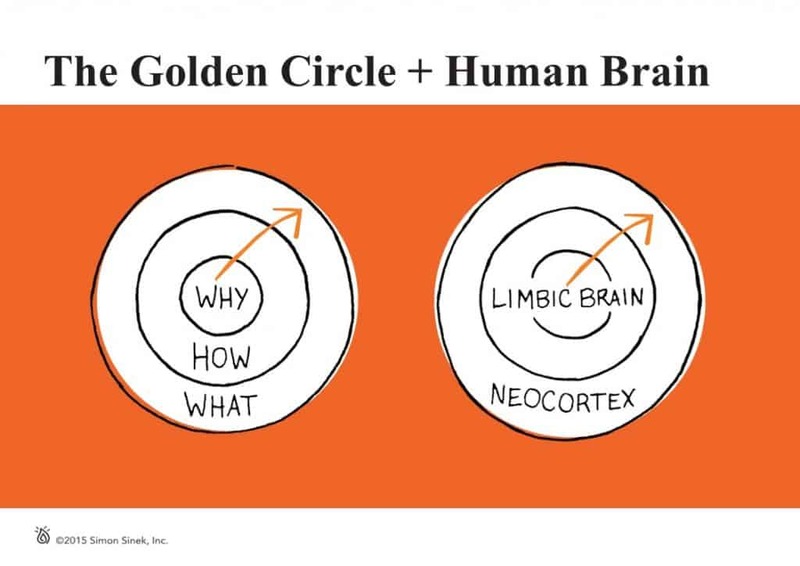 The outside of the brain is the Neocortex, which corresponds with the What level of The Golden Circle. The Neocortex is the newest brain or Homo Sapien brain. It is responsible for all rational and analytical thought and language. The middle two sections, the How and Why, of The Golden Circle make up the Limbic Brain. The Limbic Brain is responsible for all feelings, like trust and loyalty. It is also responsible for all human behavior and decision-making, yet it has no capacity for language. In other words, communicate from the outside-in and people can understand vast amounts of complicated information, like features, benefits, facts and figures. It simply does not drive human behavior. When you communicate from the inside-out, you speak directly to the part of the brain that controls emotions, behavior and decision-making. But, if asked the reason someone chooses one product or service over the other, the decision-maker often cites the features, benefits, facts or figures. The Neocortex, the thinking part of the brain, is always trying to understand and make sense of the world. This is the reason we think we are rational beings when we are not. If we were, we would never buy a product or service simply because of how it makes us feel. We would never be loyal; we would always choose the best deal. We would never care about trust or relationships; we would only evaluate the numbers. We know that we don’t do that. We do choose one product, service or company over another because of the way it makes us feel. The Limbic System controls our emotions, feelings and decision-making, but remember it has no capacity for language. 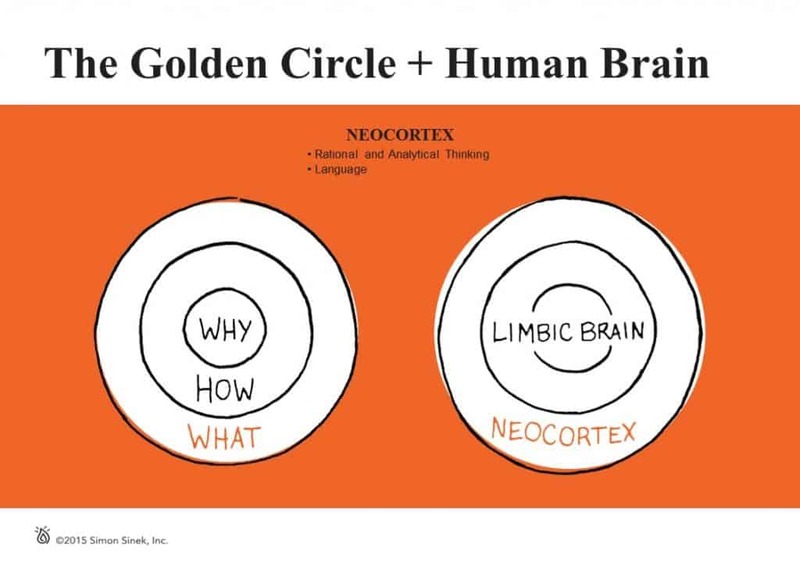 We make decisions using our Limbic System and then rationalize that decision with the part of the brain that can communicate with words, the Neocortex. There is a difference between repeat business and loyalty. Repeat business means that someone is willing to continue to do business with you. Perhaps because of your price, a feature or some sort of convenience. As soon as that convenience is no longer available, the customer complaints or leaves to meet their needs elsewhere. Loyalty is quite different. Loyal consumers may choose to suffer some sort of inconvenience to continue doing business with you. They will pay more, travel further, proudly defend and champion your brand, even if your product or service is more expensive, further away or somehow less convenient. This is the reason we can say that people don’t buy What you do, they buy Why you do it and What you do simply serves as the tangible proof of what you believe. No one section of The Golden Circle is more important than the other. The most important thing is a balance across all three. If you don’t know Why you do What you do, how can you expect anyone else to know? For others to know your Why, you must first have clarity of your own Why. The actions that you and your people take to bring your cause to life must be aligned with your values, guiding principles, strengths and beliefs. And everything you say and everything you do must be consistent with what you believe. After all, we live in the tangible world. The only way people will know what you believe is if you say and do the things you actually believe. 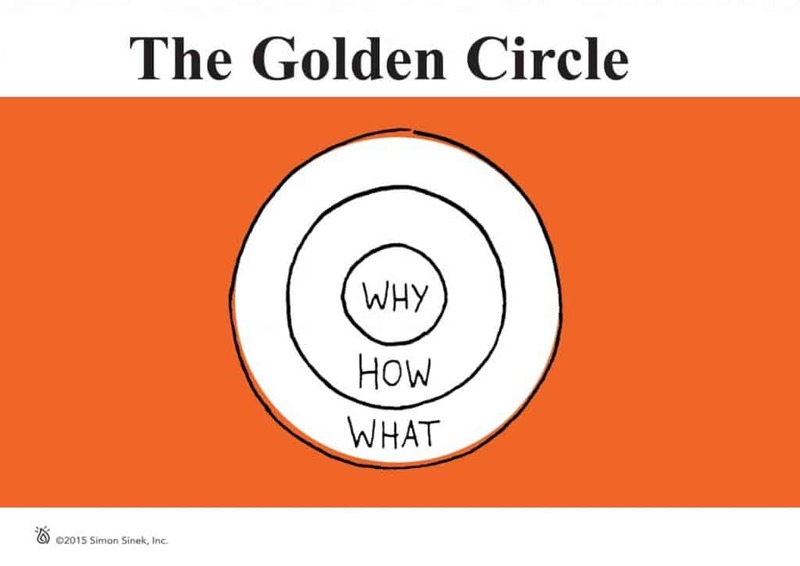 The Golden Circle is not just a communication tool; it also provides some insight into how great organizations are structured. If we imagine The Golden Circle as a three-dimensional model, it’s a top down view of a cone. 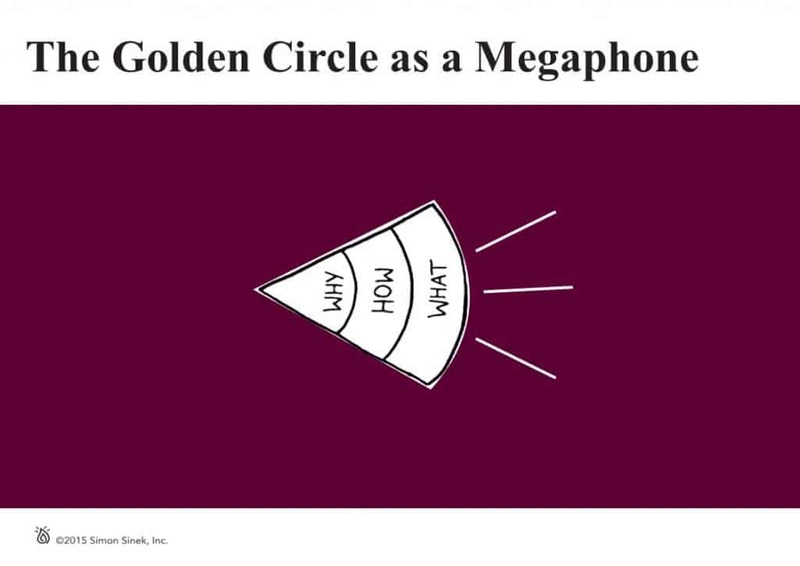 The cone represents a company or an organization, an inherently organized system. At the top of the system, representing the Why, is a leader. She articulates the Why and points to a vision of a better future. The next level down, the How level, includes the people who are inspired by the leader’s cause. They give their blood, sweat and tears to build and bring the vision to life. 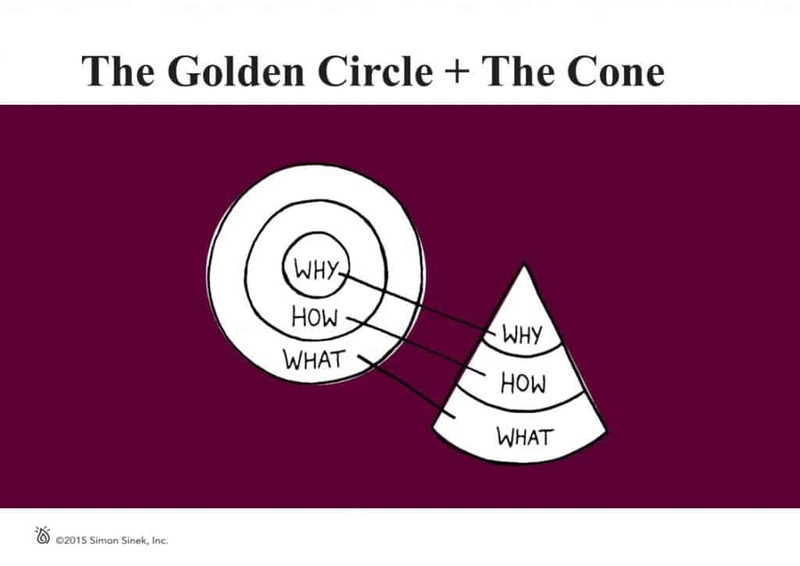 The What, at the bottom of the cone, are the things the organization says and does that breathe life into the Why. They make it tangible. An organization communicates its Why through everything it says and does; the marketing, the products and services the company provides … everything. For a message to spread, it must be loud AND clear. Like a megaphone. Loud is easy, just drive sales or buy marketing. Clear is harder. When an organization is clear about its purpose or its WHY, everyone, from employees to customers, can understand it. This clarity invites everyone who interacts with the organization to become champions of the cause, should they choose. Ideally, this clarity starts at the top of the organization and moves through the company. 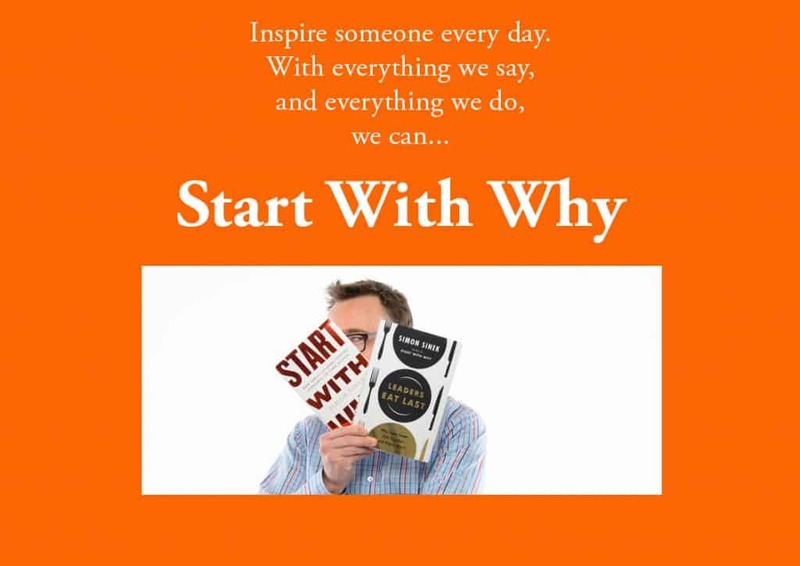 It can inspire people to create products, services, solutions and marketing that brings the Why to life. When everything you say and do echoes what you believe, you end up with a message that’s loud AND clear. Thank you Simon Sinek for this generous gift!